So guess what? I’ve passed 1000 views on this little blog! This is a pretty big milestone for me, and I’m so excited to know that there are people out there who are enjoying what I bake and ramble about, and wondering what I’m going to throw out there next. I usually dapple in pretty simple ‘home-cook’ style recipes, but to celebrate I thought I’d go all out with something special. 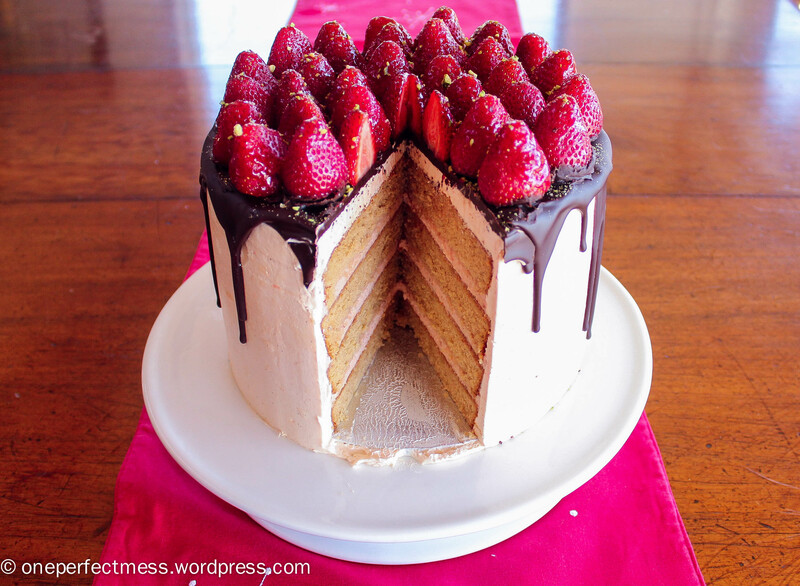 This beauty is composed of four layers of vanilla spice cake that are interspersed with layers of fresh strawberry mousse, then the whole thing is encased in rosewater Swiss Meringue Buttercream, drizzled with dark chocolate ganache, and covered in glazed strawberries and chopped pistachio nuts. Are you tempted yet?